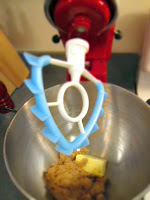 Pixel Whisk: Why didn't I think of that?! This is the amazing SideSwipe Spatula Mixer Blade. I've had this product for a while now, and it completely eliminates the "scrape down sides of mixing bowl" step in all your recipes! It will cut your mixing time in half...which leaves more time to eat those tasty treats you've just baked.